If you are interested in taking your swimming further contact us for further information or to arrange a trial. For written correspondence: City of Derby Swimming Club, Kings Chambers, 34 Queen Street, Derby. DE1 3DS. 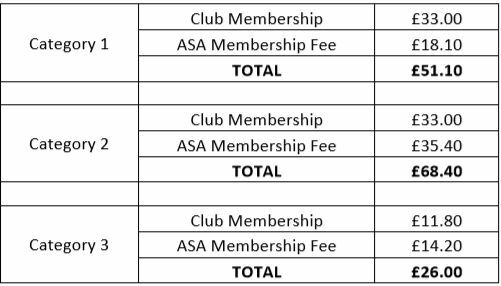 Club fee (this varies according to the ASA Category of the member). “ASA Category 1 membership is for members of any age who are learning to swim or who are swimmers at any level, who do not compete in any discipline in open competition other than those exempted under ASA Law 321.1.2 and those competitions designated as ‘Low Level Competition’. For further details and full definition of ‘Low level Competition’ refer to www.swimming.org”. Masters swimmers who compete in ‘Low Level Competition’ and do not compete in National, Regional or Open Meets. For City of Derby SC membership, this category includes swimmers of any age who compete in open meets and team galas e.g., Notts & Derby Junior League, Arena League. NB: The Club policy is for all swimmers over the age of nine (by 31 Dec) to register as ASA Category 2 members. This ensures all swimmers are eligible to swim for the club as required. For City of Derby SC membership, this includes members not covered by Categories 1 or 2 above including, but not limited to, coaches, parents and officials. 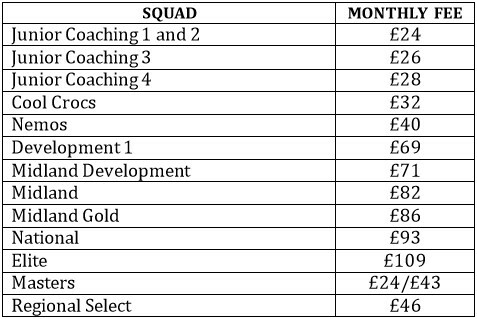 The 2018 Club Membership Fees are payable by all members, with the exception of Life Members, Honorary Members and coaches who have lead responsibility for coaching a squad. Club membership shall be paid for the full year for all members registered in January. Club Membership fees for those joining during the year will be required to pay the full years Membership Fee. ASA fees are calculated separately, set by the ASA and based on ASA rules. Payment should be made in full by cheque made payable to ‘City of Derby SC’. Membership fees are paid for a full membership year. Members who wish to terminate their membership should do so by informing, in writing, the Club Secretary. Membership fees are not refundable. Click here to view our training timetable.